Yet another tape emulation, with a solid vintage character and great delay implementation. Flexible as a delay effect. Good tape compression. Authentic tape hiss. Easy to use. Needlessly bulky interface. Very taxing on the host CPU. Not the best tape emulation out there. Tape deck emulations seem to be very much in fashion at the moment. Over the past few years, we've seen all kinds of machines and many types of tapes mimicked in software, and the quality of some of these has been nothing short of astounding. 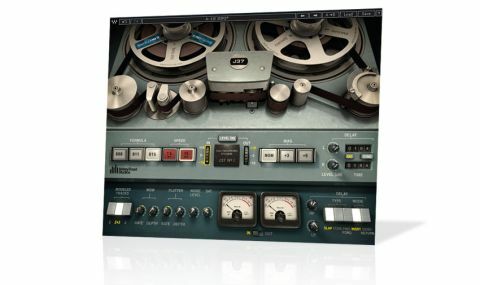 "If you know your history, you'll appreciate the significance of this particular unit, which recorded many a classic record"
Waves' latest is unique in the fact that it emulates the first ever Studer multitrack tape machine, built for - and subsequently modified by - Abbey Road Studios in 1965. If you know your recording history, you'll appreciate the significance of this particular unit, which recorded many a classic record, including The Beatles' seminal Sgt Pepper's Lonely Hearts Club Band. J37 Tape (VST/AU/RTAS/AAX) emulates the fundamental qualities of that very machine, including controls for Wow and Flutter (Rate and Depth), Noise Level and Saturation amount. It runs a selection of three emulated oxide tape formulae at either 15ips or 7.5ips: the 815 from the 70s (clean but characterful), the 811 from the mid 60s (slightly less sharp and more distorted), and the 888 from the early 60s (quite grubby in comparison to the other two). The audible differences between the three tapes are pretty subtle (especially on the cleaner 15ips mode, and even more so if you don't drive the input level), but that's reflective of the real thing. And this is, after all, a plugin more suited to the tone connoisseur than the casual producer just looking for a quick, obvious fix. "Exploring the presets makes it obvious that the delay section is one of the most valuable parts of the J37"
Exploring the presets makes it obvious that the delay section is one of the most valuable parts of the J37, expanding the sonic palette on offer from gentle saturation and colouration to wild delay effects. In this respect, the J37 reminds us of Waves' Kramer Master Tape, which features a similar variety of presets - although the J37 is certainly a lot cleaner, brighter and harder-sounding than the Kramer. In fact, the plugin has a nice general tone to it, regardless of which tape formula is selected. It does a good job of making whatever you run through it sound slightly firmer and more present. Sometimes it can be quite hard in the upper-midrange in a way that we haven't heard in other tape plugins. And it's a sensitive beast: push it even a little too hard and the resulting effect can be quite irritating - but then hard, driving distortion wasn't a desirable mix characteristic in the 60s, hence the Bias settings for reducing the level of distortion. J37 Tape probably isn't an effect you'll want to splash all over every channel unless you're specifically emulating a 60s-flavoured mix - in which case you'd better have a pretty fast computer, since it demands more CPU power than other, similar plugins. Having not worked in Abbey Road Studios in the 60s, it's hard for us to judge how closely it replicates the nuances of the real thing, but we can say that, applied lightly, J37 Tape definitely evokes at least some of the essence of the classic records that were recorded with its hardware ancestor.